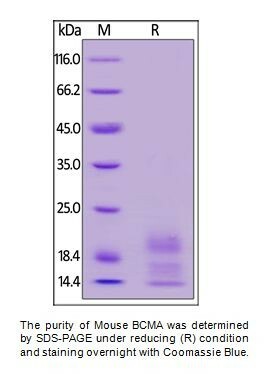 Human CellExp™ BCMA / TNFRSF17, Mouse recombinant | P1327 | BioVision, Inc.
Lyophilized from 0.22 μm filtered solution in 50 mM Tris, 100 mM Glycine, pH 7.5. Generally Mannitol or Trehalose is added as a protectant before lyophilization. Reconstitute in sterile deionized water to a concentration of 50 μg/ml. 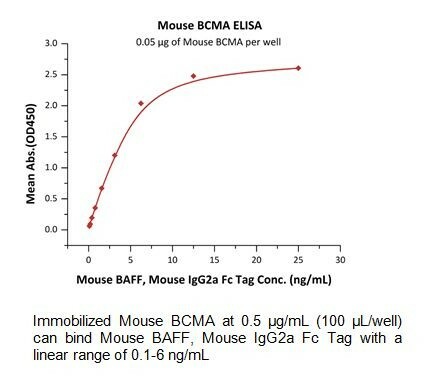 Tumor necrosis factor receptor superfamily member 17 (TNFRSF17) is also known as B-cell maturation protein (BCMA), CD antigen CD269, which is a member of the TNF-receptor superfamily. TNFRSF17 contains one TNFR-Cys repeat. TNFRSF17 is expressed in mature B-cells, but not in T-cells or monocytes. TNFRSF17 is receptor for TNFSF13B/BLyS/BAFF and TNFSF13/APRIL. TNFRSF17 promotes B-cell survival and plays a role in the regulation of humoral immunity. TNFRSF17 can activate NF-kappa-B and JNK.